This is for the pair. The cabinets do have some very minor wear, just normal for age. They have a few places, please see photos. There is something red on the top of them, not sure what it is. They need to be cleaned with a good wood cleaner. The cones are pressed in on three of the speakers. One of the smaller speakers was replaced at some time. The screens are ok, no tears or rips. The base of one of the speakers has started to separate at one corner. It looks like they were made with two staples and them screwed together. They will need a new screw just in the one corner. One speaker is missing two of the little feet, no issue using them without them. I do not have the risers. The speakers are in overall good condition, just the small cosmetic issues. They are really heavy, nice quality. 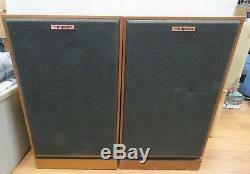 The item "Vintage Pair of Klipsch KG4 Floorstanding Wood Cabinet Speakers 3047K" is in sale since Thursday, May 24, 2018. This item is in the category "Consumer Electronics\Vintage Electronics\Vintage Audio & Video\Vintage Speakers". The seller is "godsgraceissufficent" and is located in Louisville, Kentucky. This item can be shipped to United States, Canada, United Kingdom, Denmark, Romania, Slovakia, Bulgaria, Czech republic, Finland, Hungary, Latvia, Lithuania, Malta, Estonia, Australia, Greece, Portugal, Cyprus, Slovenia, Japan, Sweden, South Korea, Indonesia, Taiwan, South africa, Thailand, Belgium, France, Hong Kong, Ireland, Netherlands, Poland, Spain, Italy, Germany, Austria, Israel, Mexico, New Zealand, Philippines, Singapore, Switzerland, Norway, Saudi arabia, Ukraine, United arab emirates, Qatar, Kuwait, Bahrain, Croatia, Malaysia, Brazil, Chile, Colombia, Costa rica, Panama, Trinidad and tobago, Guatemala, Honduras, Jamaica, Antigua and barbuda, Aruba, Belize, Dominica, Grenada, Saint kitts and nevis, Saint lucia, Montserrat, Turks and caicos islands, Barbados, Bangladesh, Bermuda, Brunei darussalam, Bolivia, Ecuador, Egypt, French guiana, Guernsey, Gibraltar, Guadeloupe, Iceland, Jersey, Jordan, Cambodia, Cayman islands, Liechtenstein, Sri lanka, Luxembourg, Monaco, Macao, Martinique, Maldives, Nicaragua, Oman, Peru, Pakistan, Paraguay, Reunion, Bahamas, Viet nam.